Okay, let’s do a little math to calculate the weight of this bad boy. 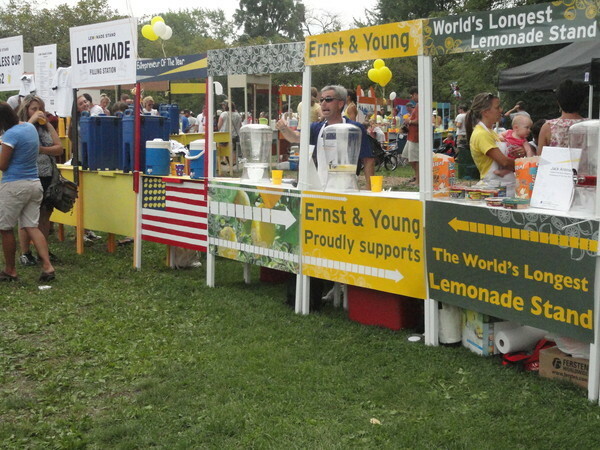 Each lemonade stand contained a sign 48” wide and 48” tall. (That’s 16 square ft. of plywood) The table top is 48” wide by 16” deep. (That’s about 5 square feet of plywood). *A common rule of thumb is a 4×8 foot sheet of 1/4″ fir plywood weighs 25 pounds. There are 32 square feet in a sheet, so a square foot of 1/4″ fir plywood weighs about 0.78 pounds. Approximate weight per stand: 15 lbs. Conclusion: The world’s longest lemonade stand weighs more than me. Want to read about more people who are taking A STAND for kids? Check out my latest post on Fat Chick Sings! This entry was posted in Uncategorized on February 1, 2012 by fatchicksings.